The tour boat Mary Jemison spent an overnight at the Port of Newark, carrying a group of about 17 travelers in a post World Canal Conference Tour, with Seneca Falls as a destination. Greeting the Friday afternoon visitors were Newark Village Clerk Lee Mikewicz and village trustee John Zornow. 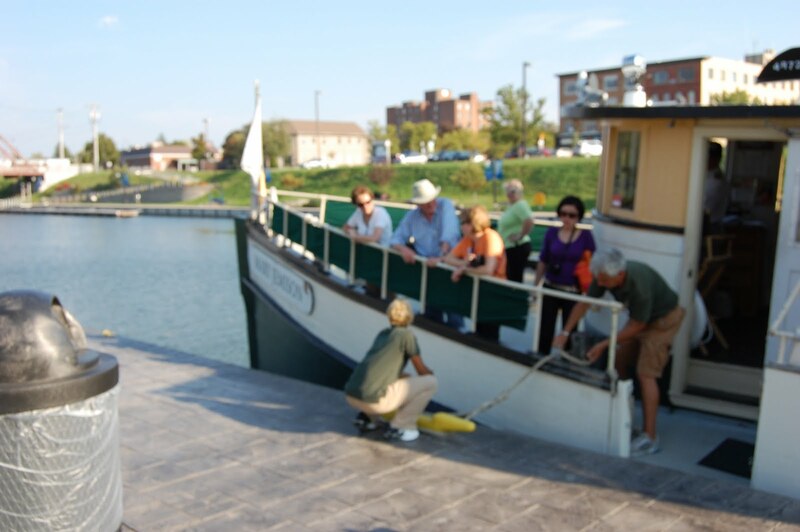 The group was given a tour of Newark's T. Spencer Knight Canal Park, the interpretative center and the murals. It was then on to East Newark, where Canal Society of N.Y. volunteers Roger Straub and Mark DeCracker described Newark's Lock 28B, the powerhouse, and the historic double locks from the early barge canal days that are the focus of the new Lockville Canal Park and trail. The tour spent the night in the Newark Quality Inn and dined at one of several downtown restaurants. Mary Jemison is a 77 year old wooden tour boat, restored and relaunched in 2008, owned by Corn Hill navigation. 2 Comments to "MARY JEMISON STOPS IN NEWARK"
Having attended the entire week with many of these delegates for the World Canal Conference. It was nice to say goodbye to my new friends. I must say while we were at Lock 28b the group was anxious to see the old Locks in Lockville. This is all the more reason we must restore these historic gems right in our own backyard.